Ok, you have been doing your test shoots and you have a bunch of photos, which are all fabulous, so now what do you do with them. Your photos won't do you much good unless you can show them and protect them. You need to show them to potential clients and photographers but you have a lot of time and expense invested in these photos, so you also want to protect them from getting damaged by being passed around and handled. You need to put them into something so you can display and present them and keep them from harm. This is where the model portfolio case comes in (it is officially called a presentation case but I have seen it referred as a binder, photo album, model portfolio book, presentation book or just a model's book). There are many types of model portfolio cases out there so which one do you need? Since many models aspire to work for a top New York modeling agency let us first consider what they use. The bigger agencies will have their own model portfolios cases made for them. The case has their logo on the front and is in their agency color. They either provide these to their models or more likely sell them ($65 or more) to their models. These are clean, attractive, functional, read like a book, quick to set-up, and project the agencies image or brand. These cases are designed to both present a stylish, professional image for the model and their agency and make it easy for a potential client to see the photos and tear sheets. They generally have a nice simulated leather appearance (vinyl but nice) and hold 10 to 40 pages (around a 9 1/2"X12 1/2" in size). These cases are designed for style and image and to take some wear and tear but not to last forever (I am sure in heavy use they replace them every six months or sooner). So this is what New York has for the New York market. You do not have to have one of these cases to start modeling but you do need a case that does the same thing. The case should present an attractive hopefully professional image, it needs to hold and protect your photographs and tear sheets, it needs to be easy to look at and handle, it needs to be appropriate for your market and it should fit your budget. If you are with a smaller agency or working freelance you will need to find and purchase your own portfolio case. Here are some of the basic features to look for in a portfolio case? When considering any other features or materials of a portfolio case you must always keep in mind that the portfolio must have a professional appearance. You will be dealing with folks who are very visually oriented. Photographers, graphic designers, art directors, creative directors, fashion editors and fashion designers all make their living by producing strong visuals. If you want to be taken seriously as a professional model you must present yourself that way. And your portfolio must have a very clean professional look. So a bunch of odd size photos stuffed in a folder won't cut it. This doesn't mean you have to buy the most expensive case on the market but you do want something that is clean, attractive, functional, and appropriate for your level of modeling and your market. Generally, portfolios come in two styles - the open book or closed, usually zippered, case. The New York portfolios started out being a closed case like a briefcase. Photos could be tossed into them and models lugged them around town from interview to interview. These cases do a great job of keeping stuff in the case and protecting it but the content can become jumbled. These cases tend to be used by the art, graphics and photo community these days. These cases may or may not have pocket pages in them. The New York agencies changed to the open book style case many years ago. The book style case has a cover and pages and reads like a book. You have to be sure everything is glued down in these books so nothing falls out. You also have to protect them when carrying them so rain, snow or coffee does not get into them and destroy the photos. They will fit into a large bag for transporting. For the same page size, book style cases are overall smaller in size then zipper cases. The zippered case style of portfolio zips up and can be carried like a briefcase. Zipping the case closed keeps things from falling out and the weather or beverages from getting in. Many have a handle that makes it easy to carry the case on its own. Its larger size might make it a little more awkward when thumbing through, but it allows you to carry presentation materials that do not fit in standard photo sleeves (mounted prints, advertising packaging, transparencies, etc.). Usually zipper cases have pockets in them for these extras. This loose material is useful if you need it to sell your services but it may not be as stylish as a slick, simple book case presentation. Both case types may or may not have pockets for business cards, extra material, bookmarks, or to label the case. Some cases may even have special features that will allow them to stand up for display purposes. The outside or cover of the portfolio case needs to do two things, it need to protect what is inside (wear and rigidity) and it needs to project an image (it needs to look good). The cover will take the wear and tear of handling and transporting. It is also the first thing someone sees when looking at your portfolio. Common portfolio case coverings are plastic (vinyl, polypropylene, acrylic), leather, cloth, metal or wood. Plastic is the cheapest and maybe less durable. Leather is more expensive but can take more years of wear (even though some good quality plastic will look better and out last some cheep leather). Cloth, metal and wood are used more to create an interesting appearance or supper durability and are less common in the modeling world. Within each of these materials there can be differences in quality that can affect appearance, longevity, and price. So ideally you want a cover that says 'I am a professional' and that you can pound nails with. The pages that hold your photos in the portfolio normally come in four types of material - vinyl, polypropylene, polyester or Mylar. Vinyl pages are very clear, fairly rugged and reasonably priced. At one time these were the standard that everyone used. But through the years we have found a few short comings with these pages - they release chlorine gas that will bleach out photos (not archival), things stick to them (this is over come with texturing but you loose clarity), they scratch easily, and over time they become brittle, plus their price keeps going up. Polyester pages came in to overcome some of the problems of vinyl but they are not as optically clear as vinyl. With some early lower quality pages you were viewing the photo through a milky haze. Some of these pages went to a non-glare texture to overcome this problem (you can't tell it is milky because the texturing breaks up the light passage). Polypropylene started out with these same drawbacks but have greatly improve their clarity. Polypropylene now combines of best of vinyl and polyester - clear, rugged, non-stick, archival, and a good value. Mylar pages are very clear, better scratch resistance and archival quality, but unless you get a fairly thick Mylar, the pages can be quite fragile and as you get thicker Mylar the cost goes up. Just so you know, the New York books are using non-glare (very textured) vinyl pages. Most of the pages that are out there are some type of pocket page. This mean they are open at one end (normally the top) and sealed on the three other sides. Materials are slipped into this pocket on their own or on a transport or mounting sheet. Each pocket page gives you two "views" front and back. So if a case has 20 pages it will show 40 photos. There are several methods for holding the pages in the portfolio. The least expensive and least flexible, system is to glue or fuse them into the book (most of New York cases are this type). Next up is a metal comb binder setup like you find in a three ring binder but with many more rings (well made one work fine, cheep one will give you trouble). Another method is metal screws and posts. The comb binder and screw post cases lets you add and remove pages, as you need. The glued or fused page setup leaves you with just the number of pages that came with the book - no adding or removing. The tried off here is flexibility verses cost. 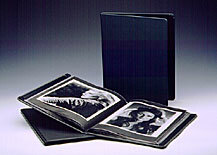 To glue, fuse or stitch a set number of pages to the portfolio cover is far less expensive then a ring binder or posts. What you gain with the ring binder or posts is the ability to have just the number of pages you want in your portfolio. Also, with the ring binder all of the pages will lay flat. With the post and fused case none of the pages lay perfectly flat. Is this a big deal, not really. The cover and pages combine to display and protect your photos and tear sheets. Generally a portfolio case with materials that looks rich, holds up to wear and tear, and gives the most flexibility on number of pages will cost more. If you are buying a case you expect to use for years this can be a good investment. On the other hand if you do not know where you will be or what you may be doing in six months a simpler, less expensive case could be the way to go. 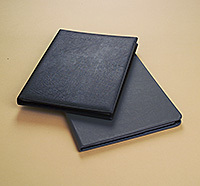 Portfolio cases come in a variety of sizes (size is based on the maximum size that will fit into a pocket page). The smaller size cases hold 8"X10" enlargements (common photo print size) or 8½" X11" sheets of paper (printed catalog, magazine, flyer size). This allows you to put standard size photographic prints and common business size printed piece in the portfolio. A larger size case, often 11" X 14", allows you put larger 11"X14" prints in it plus it can hold over size tear sheets from magazines (W), multi smaller prints per page or other business printed material. The idea of the larger case is to make a bigger impression with the larger prints and to be able to hold larger tear sheets. The disadvantage is it cost more, is a bigger thing to lug around and takes up more desk space when viewing. The New York Cases split the difference tend to be 9"X12" or 9 1/2" X 12 1/2". This size holds picture magazine size tear sheets found in Europe but also will hold 8" X12" print that are becoming popular. Which is the right size? Some of this might be determined by what your modeling agency wants. If they are set up for certain size case you most likely will have to go with that. In general the smaller size will be fine for someone just starting out. When starting out the only thing you will have to put in a portfolio will be prints from test shoots. These have traditionally been 8"X10" in size although the 8"X12 prints are becoming more popular (full frame 35mm film size and cost about the same, I love-em). As you get more actual jobs and tear sheets and acquire better quality test photos you may need to move to the larger book to hold them. I remember many years ago (late 70's) when I was first starting out we printed everything as 8X10 or 5X7 size prints. All of the portfolios we worked with were in the 8.5X11 format (standard catalog or flyer size). At one point we had a model relocate to our area from a larger market and brought in her 11X14 portfolio. It had very good work in it and the larger format size just blew us away. If you have very good photos, the larger format makes an impression with more impact. As I have moved on with my career I have found that having very good content (good quality tear sheets) is more important then size or even type of portfolio case. There is no one answer. You need to look at where you are in your career and the market you are working in and the sales presentation you need to make. Some markets may demand a top of the line case or book. Others you can begin with something less expensive and progress up as needed. I am still using an old zip up notebook binder but for the way I sell may services it works well for me. What is most important on any portfolio is the quality of the material you put in it. Don't spend a lot of money on a case until you have great images to put in it. But you often can't get the best test shoots until you have a portfolio to show (chicken and the egg thing). You do need to start with something but think about how you are going to use your case/book in your marketing before you buy. I continue searching for new and better ideas in portfolio cases. I also look for cases that give the best bang for the buck, the best value for the market it is to be used in. The above information gives you some basics. You will need to do your own shopping around to find the case that is right for you. Your portfolio has be something that you are proud to present without any excuses or explanations but not break your budget. So be sure to get a portfolio case you feel good about.